A former high school classmate of Randy Kancel’s remembers him as a leader and role model, and these qualities still radiate in him today. As Community Bank President for UMB Bank, he goes above and beyond to ensure that his customers reach their financial goals, giving them the individualized support they need. Kancel has had a prosperous career in Kansas City, Kansas that includes his current position, nine years as commercial real estate supervisor for Wyandotte County, and six years as vice president of Security Bank. He credits his strong work ethic to his athletic background. Kancel began swimming at age seven for Victory Hills Country Club. One of his coaches, Pinky Haar, saw his passion and gift for the sport and encouraged him to join the Wyandotte High School swim team. So before his junior year, Kancel transferred from Bishop Ward High School to Wyandotte, helping the Bulldogs to a second place finish at the state high school championships. Kancel said Haar instilled in him the importance of setting goals, and gave him reasons to believe in himself. Kancel attended the University of Kansas on a swimming scholarship and earned a bachelor’s degree in journalism/public relations in 1976. 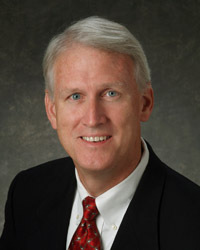 In 1982, he received his MBA from Rockhurst University. After earning his MBA, he applied for a job in the commercial real estate appraisal business. He was surprised to learn that his boss hired him due to his swimming background, and a reference from another Bulldog. “Because I was a swimmer, he knew I would work hard, and that’s one reason he chose me for the job,” Kancel recalled. His involvement in the community extends beyond his work at UMB. He is a board member on the KCK Chamber of Commerce, Wyandotte Development, Inc., and Cancer Action, Inc. He is a Member of the Appraisal Institute (MAI). He wants today’s students to remember to set goals and follow their passion.